Yesterday was full of fun on the water so we crashed and burned before getting our blog up. 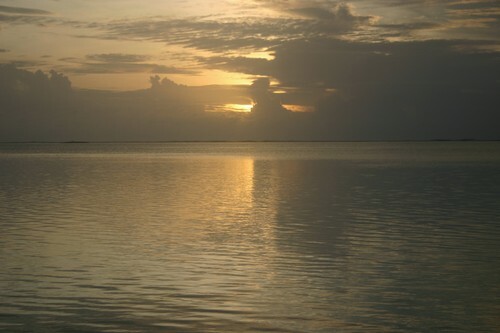 We started the day watching the sun rise on the lagoon side of the island. It was amazingly beautiful. After the sun from the previous day, we were careful to not get too red so we spent the morning/early afternoon playing cards. i redeemed myself from the previous day slaughter but in the end Wes is up 3-2. After lunch we went snorkeling at a new reef. The visibility underwater is actually better in the rain, the sun makes every speck glisten and it can be harder to see. Despite the sunny conditions we did get to see a ton of new kinds of fish, some were really really big. After snorkeling we did a quick change and then hopped on the sunset fishing cruise. No rods, just these spools of line with a hook and weights at the end, apparently the traditional Maldivian way. I couldn't believe the size of the fish that were being caught, no white or yellow perch here. Each fish I swear was longer than a foot and weighed more than 15 pounds. There wasn't much to be had until night fell. I finally caught one in the last fifteen minutes, showing Wes how it was done, and reeled in a gigantic 2 foot long, 20 pound red snapper. That thing almost broke my arm off. It was so pretty and pink that I wanted to toss it back but my Maldivian ship crew was ready to cook it up for us when we docked. We declined the fish dinner and chose a comfy bed instead, a busy day on the Indian Ocean made us sleepy, we decided to skip dinner and head to bed early.